← Do they do 5ks in Warsaw? Will I come back a skinnier me? While in Lithuania, one should try these national dishes: appetizers – Piršteliai prie alaus – thin, rolled-up puff pastries served with beer main courses: Cepelinai (or didžkukuliai) su spirgučiais – potato balls with meat ; Vėdarai – a sausage, made of a potato stuffed intestine of a pig Skilandis – pig stomach stuffed with meat, garlic and cold-smoked; Plokštainis – meal of potatoesBulviniai blynai (grated potato pancakes) with different sauces; Virtinukai – curd patties; Kastinys – soft sour cream butter; Šaltnosiukai – dumplings filled with lingonberries; Fish – pike or perch, is often baked whole or stuffed, or made into gefilte fish (various prices); Herring (silkė) – marinated, baked, fried, or served in aspic; soups – Šaltibarščiai (a summer soup based on beets and soured milk), Juka (blood soup) or Cabbage soup flavored with carrots, ham, onions. Ruginė duona (dark rye bread) is very advisable to try with soups. 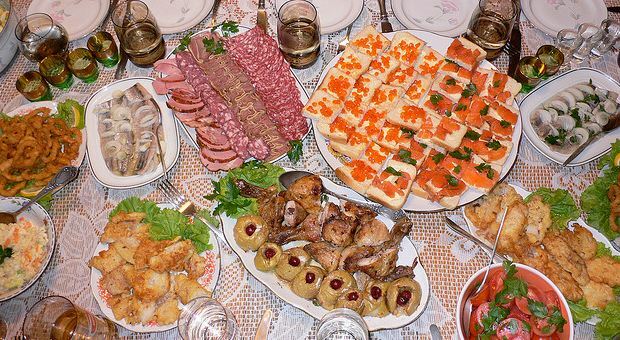 Lithuanian cuisine is also famous for wide use of wild berries, mushrooms, and cheese. Honey and poppy seeds are commonly used as filling in pastries. For desserts, try Žagarėliai – twisted, thin deep-fried pastries dusted with powdered sugar or Spurgos – a Lithuanian variant of doughnuts, often filled with preserves. Of course, European, Oriental, French, Italian, Russian and other cuisines are available at Kaunas’ restaurants. I think I would have to be blindfolded to try some of those dishes lol! Let me know which ones you try!